Janie says we're toughing it out in Zion National Park. (Note solar panels and Watchman Mountain on right rear.) Though conditions are obviously austere, still, she wonders if you'd: "Care to join?" 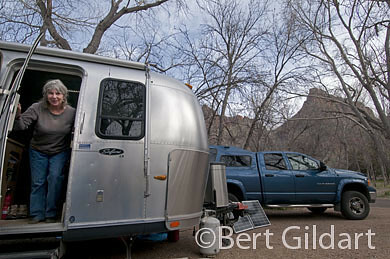 ©Bert Gildart: When weather conditions deteriorate there’s not a whole lot an RVer can do but roll with the punches. Right now — as I write — Monida Pass, the 6,824 foot-high pass that separates Montana from Idaho, is experiencing blizzard conditions, and we must cross it in order to return home. No big deal, we’ll just stay another day in Zion, which has also experienced inclement conditions. Unlike Mondia, which is getting lots of snow, Zion has gotten only a little bit of snow; still its presence creates even more glorious conditions. Colors are more saturated and geological lines created by the ages seem more pronounced. Campgrounds also seem to clear a bit, and that could be a good thing as the Watchman Campground has been booked through to November, and so we have not been able to get in. However, South Campground is immediately adjacent to the Watchman and though it offers no electricity (Watchman does) that has not been a problem, even with cloudy days. Our four solar panels (two on top and two portable ones) are adequately collecting sufficient energy for us to do anything we want. With them we have power to operate my energy-consuming computer and the equally as energy-depleting fan that blows out heat from our Airstream’s furnace. Even on cloudy days. Click for larger image. L to R: Checker Board Mesa, ancient snag; Altar of Sacrifice, so named for streaks of red created by ancient depositions of iron oxide. And so we are warm and productive and have been enjoying other aspects of this park, which turned 100 just last year. We’ve again toured Zion Canyon (by shuttle bus now, as starting April 1 cars are no longer permitted ) and photographed several more magnificent edifices, specifically Abraham Peak and Isaac Peak – whose names are symbolic to the Mormons. Abraham and Isaac combine with Mount Moroni to form the Court of the Patriarchs. Moroni was named for the angel that Joseph Smith said visited him on numerous occasions, beginning on September 21, 1823. The angel was the guardian of the golden plates, which Smith said were buried near his home in western New York, and which he said were the source material for the Book of Mormon. Though the tableau has never been found still, its presumed existence inspired the Mormon religion, which has endured. 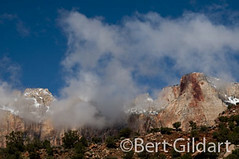 Abraham and Isaac peaks photograph well in early morning light. Other features were named by Mormons and one is the Temples of the Virgin embracing the Altar of Sacrifice, so named for the red streaks that course downward. The streaks, which look like blood, actually derive from depositions of iron oxide. Clouds and snow of the past few days have dramatized the temples and framed (see above three photos and then focus on image to the right) the Altar of Sacrifice. 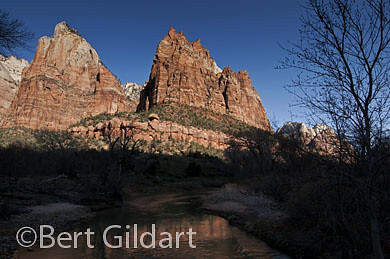 Later in the day, Janie and I drove the Zion Mt. Carmel Highway. 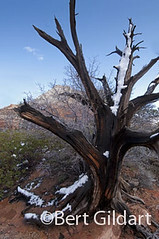 Snow had splashed an ancient snag with patches of white and melt water helped dramatize latent colors in the wood. We drove to the East Entrance and photographed the banding in Checker Board Mesa. 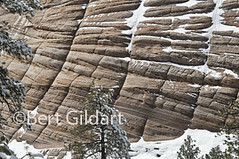 Horizontal banding was created by Jurassic winds, which deposited vast bands of sand in what is now Zion Park. Though the bands tend to be horizontal, when these ancient winds shifted, so, too, did the inclination of the layers. Vertically oriented bands are the result of freezing and thawing, all combining (again, see above) to create a checker board appearance, hence the name. 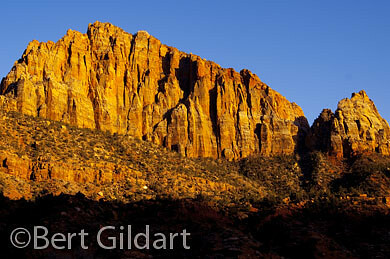 Sunset adds wonderful red glow to the Watchman -- heralding not only the end of the day, but also the end of our stay in Zion National Park. Our campground “home” in South Campground is back dropped by a huge monolith called the Watchman, and the other night, the setting sun imparted a wonderful red color to the huge mountain, creating a colorful ending to our day as well as to what is most likely the end of our time in Zion. The experiences now add to those I’ve been enjoying in this park for over 30 years and which Janie and I have been enjoying for almost 20 years. Zion has always been one of my favorite national parks, and the rain and snow have done nothing to alter those feelings. This entry was posted on Tuesday, April 6th, 2010 at 4:36 am and is filed under National Lands, Natural History/Conservation, Photography, RV Travel, Travel. You can follow any responses to this entry through the RSS 2.0 feed. You can leave a response, or trackback from your own site.